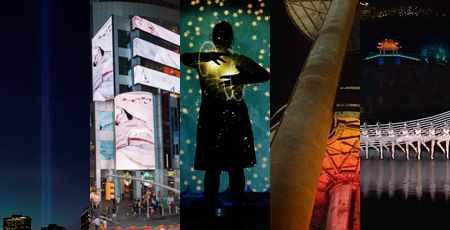 New York and cities around the world use night illuminations to entertain, fascinate, and to remember. Here's a recent sampling. 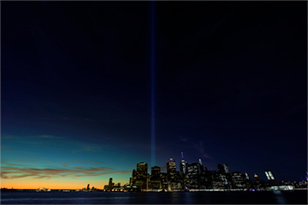 As joe's nyc captures so well this morning, the Tribute in Light (first displayed six months after the September 11th attacks) reminds us it's better to light a candle than to curse the darkness. Recently, buildings have been illuminated for the attacks in Nice, Orlando, Paris and Brussels. On the Manhattan Bridge Over- and Underpass in DUMBO, Digital Light Projections return September 17-18 and 21, from dusk to 10pm. One night in June, People for the Pavilion brought light (and attention) to the New York State Pavilion. One of the organization's co-founders, Matthew Silva, has produced Modern Ruin—a film about the World's Fair relic. Here's hoping the pavilion gets the creative reuse it deserves. At last week's G20 summit in Hangzhou, attendees were treated to light shows coordinated among many buildings as well as an excerpt from Swan Lake performed on a lake, pointe shoes in the water! This World Made Itself is the performance by Miwa Matreyek, using light, music and projections to convey a journey of discovery. It's part of the White Light Festival, which runs October 16-November 16. This World Made Itself is performed October 20, 21 and 22. Every night in Times Square, from 11:57pm to midnight, is the Midnight Moment series when about two dozen electronic billboards in the area join together. Each month is a different theme; September is Tantris (Young Tristan), coordinated with the Met and its production of Tristan und Isolde. The opera is broadcast live in Times Square on September 26.